Although Runes of Gallidon was only at Wyrd Cond 2011 for a brief time, we had a great time (especially running our "Spirits of Kita-mura" LARP - but more on that later!). With so many workshops, panels, film showings, games, and presentations, it was impossible to see all of the convention. But for those who couldn't make it, here's a taste of what you missed and perhaps a reason to sign up for Wyrd Con 2012! LARPing at Wyrd Con 2! Gallidon is very excited about "Spirits of Kita-mura," the upcoming LARP it will be running at Wyrd Con 2! Unlike many LARPs, this one has already started with "Spirits of Kita-mura," short story that introduces many of the main characters and the small village of Kita-mura. If you're interested in stepping into the world of Gallidon - literally! - be sure to register for Wyrd Con 2 so you can watch the story unfold or even sign up to play one of the "Spirits of Kita-mura" characters! Gallidon Welcomes its Newest Artisan, badgervince! With a debut Work based on Luka e'Lagun from Maia Jacomus' "The Great Drift," badgervince is the latest community member to earn the title, "Artisan of Gallidon." And more of badgervince's art will be published soon, as the final chapter in The Great Drift is about to be published...! Welcome to Gallidon's newest Artisan, Beestie! A new Artisan joined the ranks today: Beestie. His debut Work, "You Can Never Go Home," introduces Tatianna D'Chai and her servant, Timoteo Qatsar, both from the Sea of Grass but - for some reason - find themselves wandering through the icy terrain of the North Realm. The Artisan Attribution page has been updated. If the Artisan has a user avatar, it will be shown in the listing. If the Artisan allows others to contact them directly, a link to their contact page will be listed. We hope this makes it easier to find and connect with Gallidon Artisans! First, it was exactly two years ago that Runes of Gallidon opened its doors online with the first offerings of official works. We've really enjoyed sharing our own ideas about Gallidon's story, but the contributions from our creative community have been the highlight. It's been a wonderful journey so far - thank you for your support! Second, the Stewards want to wish everyone a Thanksgiving weekend of fun, family, friends, and feasts! We'll be taking a bit of a break this week, so no new content will be published (the 'Morgan' comic will resume publication on December 3rd). As part of our on-going series of updates to the runesofgallidon website, we just rolled out a new feature that makes it easier than ever to find all of the Works by your favorite Gallidon Artisans. 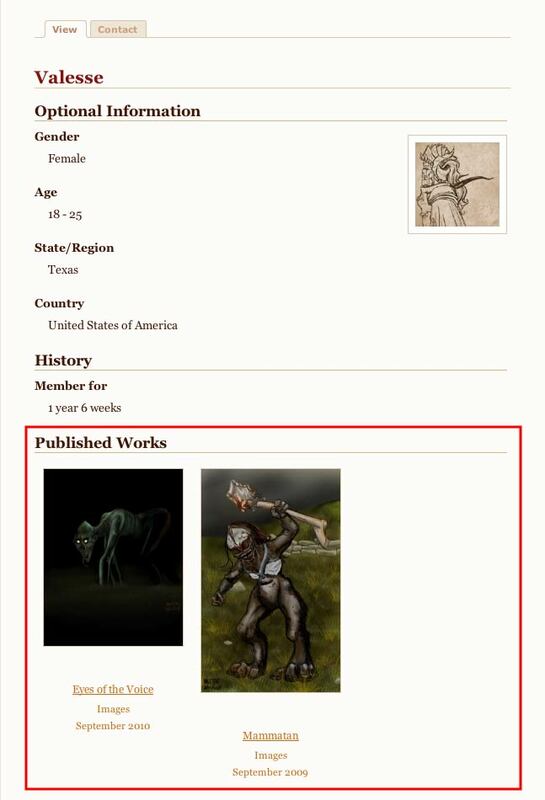 When visiting an Artisan's account page, all of their published Works are now shown in a section called, "Published Works" (in the same format as the main Works Gallery). 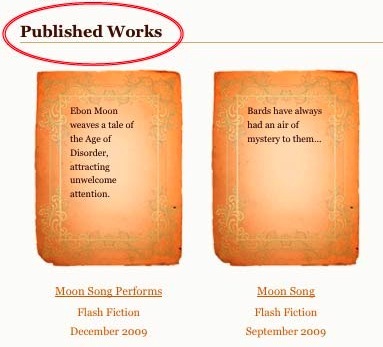 The Published Works section is below their personal information.